the bonus is it’s so easy to make at home! Do you ever wonder where food bloggers get their inspiration? (Or maybe you just haven’t cared one tiny bit…that’s OK; it’s MY obsession!). Well, for me, it comes in myriad ways and for the most part it’s got a heavy dose of spontaneity involved. I’ve said it before and it’s so true; often it’s what’s in the fridge that offers me inspiration or in some cases, maybe it’s really desperation? Something needs to be used and I start thinking of ways to get that done. 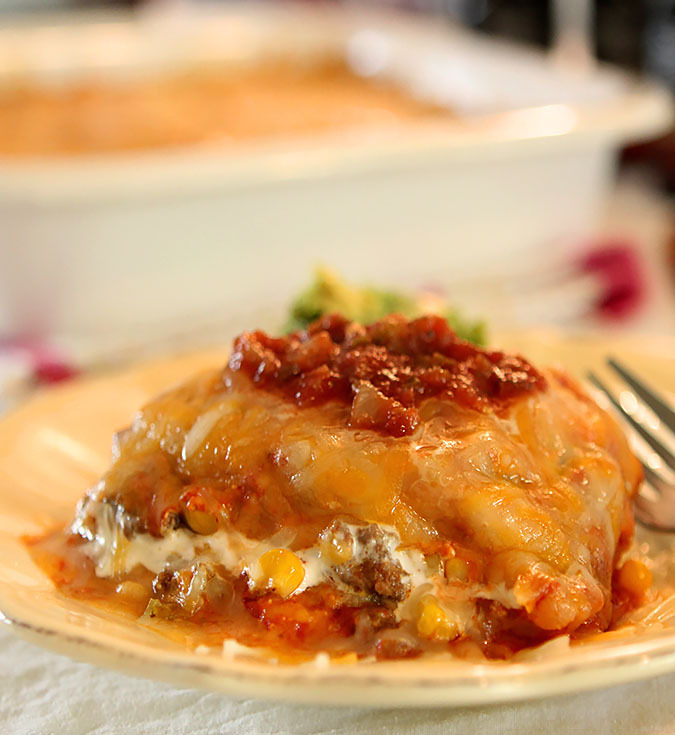 That’s the story of this Enchilada Casserole that combines ground beef, green chile sauce and frozen corn. It was a combination of things that saw it come to fruition. Corn tortillas from Costco (meaning LOTS of corn tortillas!) in the veggie drawer staring at me, thawed ground beef whose day had come; you know, use it or lose it forever, a freezer with frozen corn and most crucial to this plan? In an organizing frenzy, the uncovering of a case of goodies from the folks at 505 Southwestern. I so wanted to make something using their products but they had escaped me a bit; my unsettled life has made food blogging a tiny bit whole lot harder as I juggle every day where I’ll cook and where I’ll take photos so stuff is scattered between two locations; where I’m living now and my daughter’s. And Murphy is having a party with me; seems the ONE thing I need for success is always at the other location. That everything I needed for this dish was in one spot; well Murph apparently took a much needed day off! Though I had never made them before I mentioned to a friend that enchiladas were on my mind. She had never made them either, mentioning that she preferred to make an enchilada casserole and that was it…I was off to the races. To be honest I had never had nor heard of an enchilada casserole so I did some sleuthing…err, Googling! I found a myriad number of recipes that make it clear that it was just a layered dish using the usual suspects but in an easier, family friendly style. Tortillas, filling, cheese, sauce. Easy enough huh? Not so fast! A widely raved about recipe just said bland to me and beyond bland? One-half pound of ground beef in a 9X13 casserole? In a word, seemed a bit puny; not to offend the brand that shall not be mentioned Better Homes and Gardens but it needed help. So I upped the volume. More beef, more spices, more enchilada sauce, some green chiles added to the mix and yes, MORE cheese. I never once considered not using these sauces. As much as I love to cook, making green chili and enchilada sauce to accomplish this dish was just not going to happen. Still I like to think I’m discerning enough that not just anything would do. I like that they are all natural; my propensity towards homemade has an equal one that runs the other direction from a list of artificial ingredients. Their chiles are picked, flame roasted and flash-frozen during harvest and I guess I especially loved that they all come from the Hatch Valley in New Mexico. Hatch chile season is serious business in this part of the country and if I can’t get fresh ones for roasting, well, let’s just say I’m a VERY happy camper that this fabulous product was just waiting for me to use! That blandness I found in the original recipe? Beyond upping the amount of beef and increasing the spices a bit; it was the addition of half a jar of the Green Chile sauce to the filling that really made the difference. Big difference. Huge. All together? A serious YUM!! I’m sharing the fruits of my labors with others at each meal right now and let me tell you I wanted to hide the leftovers. Mine I tell ya…ALL MINE! And one of the best things? Just like the choices listed on any Mexican menu this is just crying out for you to switch things up. Missing some of the ingredients? How about throwing in some pork and black beans or chicken and pinto beans. I could even see an all veggie version; the perfect time of the year to use the abundance of produce available. Was it good? SO good. Serve with some fresh guacamole and sour cream and I promise you raves. Yes…I really did hear them! Not to be too bossy or anything but MAKE THIS CASSEROLE!! 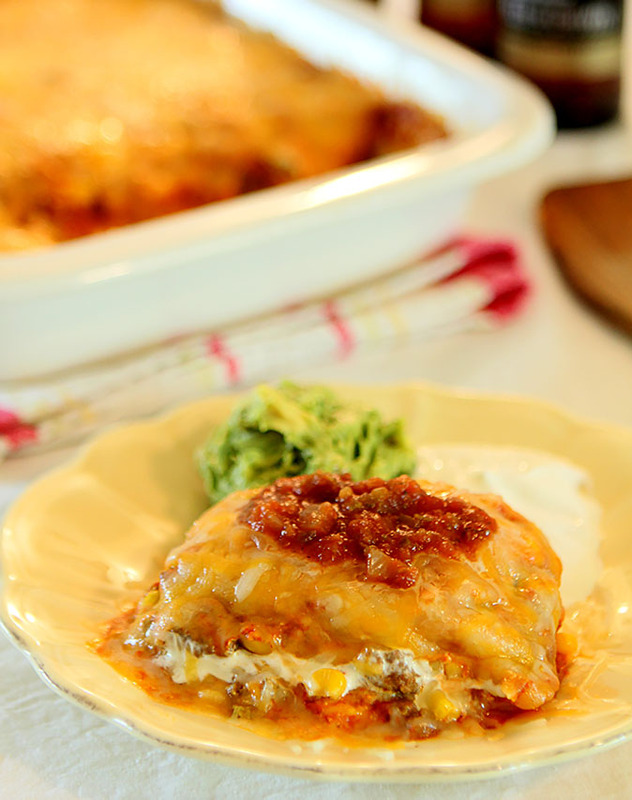 The Best Enchilida Casserole has Beef, Green Chiles and Corn! A great easy way to serve enchiladas to a crowd. Spray a 9X13" casserole dish with cooking spray or use a napkin or paper towel to wipe surface with softened butter. Saute beef, onion and garlic until beef is cooked and onion is translucent. Add chili powder, cumin, corn and green chile sauce. Simmer for 15 minutes on low heat; remove from heat. Mix all ingredients with a spoon; set aside. 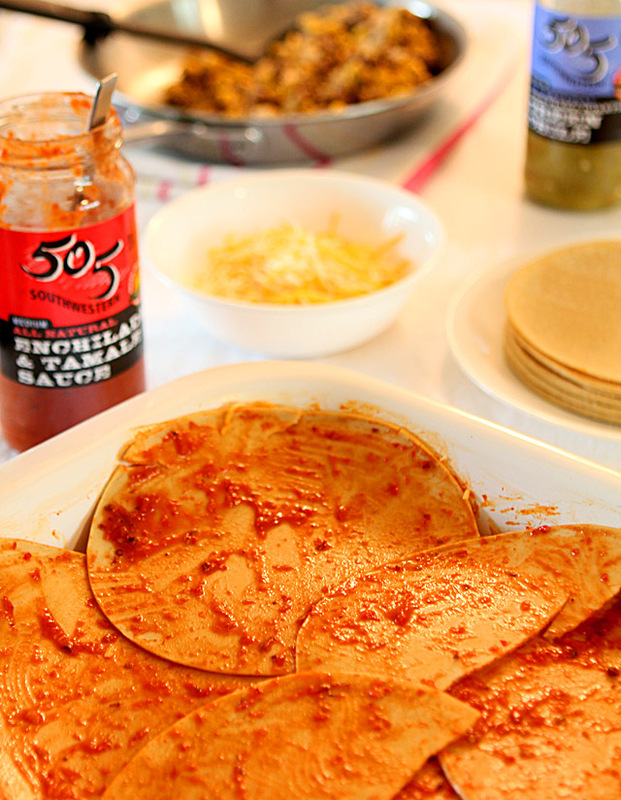 Using a pastry brush, lightly brush both sides of the corn tortillas with enchilada sauce. Fit half of the tortillas into your casserole dish. (I used 4 whole corn tortillas fit into each corner and halved one additional to overlap them in the center on the long side of the dish). Top with half of the meat, corn and green chile mixture. Using half of the sour cream mixture, dollop spoonfuls on top of the meat and then gently spread it to cover. Spread half of the enchilada sauce over the sour cream; then scatter half of the cheese over the sauce. Repeat all steps EXCEPT the cheese; hold half of it aside. Remove from oven, top with cheese and bake for an additional 5 minutes. Remove from oven, let sit for 8-10 minutes to firm up. Top with a dollop of salsa and serve. I was provided with samples of the 505 Southwestern sauces however all commentary is my own. There is no better Enchilada sauce…and as a Texas living on the New Mexico border, I speak from experience! I whip my corn tortillas through a quick hot oil bath..makes them pliable…it’s a fatty recipe for sure…but people love it! This casserole looks fantastic! Pinning to make soon – pictures are making my mouth water! Thanks Pamela; we really enjoyed it…my daughter so much she made it herself the next day and took it to work where it disappeared quick! Ok. I came here to see if you posted the toffee recipe after seeing your photo on IG. Instead I found this! Bingo! Dinner tonight! Thanks Barb! It will be good when your lives settle down a bit. I worry about you both. That enchilada looks perfect. What a wonderful dish! Aw thanks Maureen. The sellng/moving business almost killed me but having it done does not mean things are easy and I’m sort of craving easy…or at least easier. I haven’t even started to look for a place yet. Wishing OZ was real and all it took was the clicking of my heels and I would be in my own home again! You know, I’ve never had an enchilada. I think this casserole is the perfect way to give them a whirl. I don’t know how you do it Barb, dealing with selling your home and finding a new one, Lauren’s treatments, living at a friend’s place and still maintaining such a wonderful blog week in and week out. I admire your determination and your stamina and I’m happy that Murphy gave you a break. Great post, much continued success with juggling everything on your plate so graciously. Looks awesome, might have to make that this weekend. I have corn tortillas and 505 enchilada sauce. Topped with all that cheese, looks delicious! Well yes you might have some similar ingredients huh? I have some of the green chile sauce leftover so I’ll bring it over to you; it was a great addition to the meat layer. 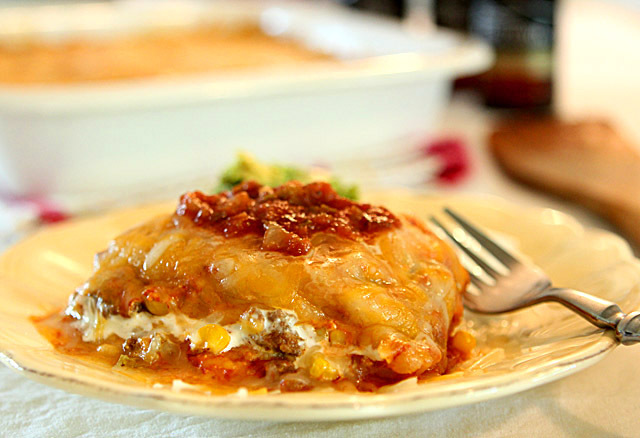 B, your Enchilada Casserole looks phenomenally good! We like to add a 4 ounce can of green chiles to our beef (1 pound) mixture for taco salads. Now, we should be thinking of doing the same with our enchilada filling and adding some corn, too! What a fabulous recipe born out of serendipity! Thank goodness for happy kitchen accidents. Well, not entirely. You did have some input in conceiving this recipe after doing some due diligence in research! 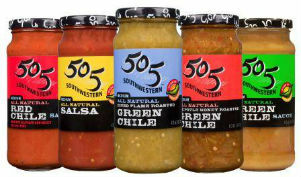 I’ve now learned it is a good thing to have some 505 Southwestern of different varieties on hand in the pantry due to their all natural ingredients–which is HUGE with me! Thanks for sharing 505 Southwestern with us and for yet another outstanding recipe! xo P.S. Oh! Yes…will definitely be making this soon! This was such a hit and I seriously had to hide a piece…living with a man in the house is hard; I forgot how much they eat! Barb, where have I seen this 505 sauce– is it King Soopers or Costco?? I know the label caught my eye but I didn’t have a recipe in mind. Now I do thanks to you. I think enchiladas are a great make-ahead meal and I wonder if they freeze well too? I think I’ll make a batch then save them for nights when i don’t have time to cook. Someone on their website mentioned Walmart but I’m thinking King Soopers too. I would love to see them at Costco; I’ll ask and see if they are there! HI Ladies! You can find is at both King Soopers and Costco- depending on the state! Walmart carries our All American salsa as well that benefits Wounded Warrior Project. We’re in Denver, Colorado. I looked for a store locator on your site but didn’t find one; did I miss it? In any event King Soopers (ie Kroger) is everywhere and it’s good for me to know! Thanks a bunch. That always makes it easier doesn’t it…hope you made it and enjoyed it Tanya. I don’t often make enchiladas (once every couple of years) but when I do, it’s usually in a casserole. Just seems simpler to me for some reason. Your version looks great! The 505 brand is new to me – sounds interesting. Good stuff! 😉 Thanks. Well I’m sure glad someone turned me on to a casserole; I was expecting a much bigger and messier production. I seriously love these sauces John…it was a great find. Funny you should say that but I did that yesterday…it was a great breakfast too! I’ve never tried their sauces but this casserole sounds good. I also look in the fridge to see what I can come up with. And last night we had pulled pork enchiladas. Not bad either! Hope you get settled soon! Yowza! This looks good! Of course I am an absolute sucker for enchilada anything, but this dish looks especially tempting. Your photos are so good that I feel like I could just grab a fork and dig in. Your hosts are two lucky people. They may never let you go. I’m dying to make it again soon…next I think chicken or pork with black beans is in order here. Come on up!